This Single Sided Lunch Box Trolley is perfect for nurseries and schools. It allows the user to easily transport lunch boxes and other items around larger buildings. The strong welded steel frame allows it to be packed to capacity, without the risk of breaking. Two large handles on either side of the lunch box trolley combine with robust castors to help the trolley glide across most surfaces. When stationary, it provides a suitable storage place and one that keeps all food elevated from the floor. 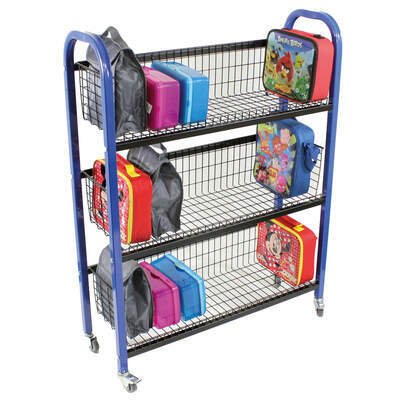 This lunch box trolley can be used in the classroom, canteen or even during outdoor play. The durable metal design is easily maintained and stores away until required alongside other apparatus. Alongside our single sided lunch box trolley, our collection of Catering Supplies lends itself to a range of different industries. We have our Super Tuff Tumblers and matching Dinner Plates available for bulk order at wholesale prices. And, our range of Napkins is sure to feature something appropriate to your needs.